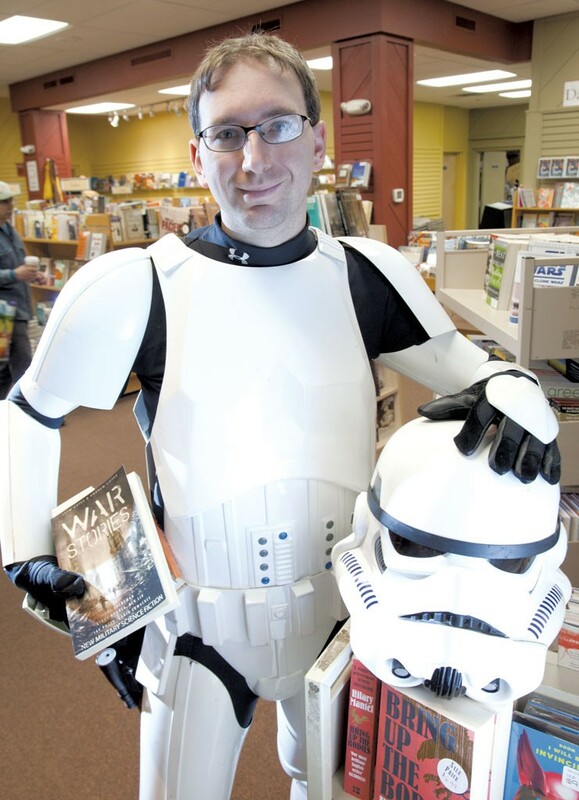 Forget whatever preconceived notions you may have about a science fiction anthology that was coedited by a Norwich University administrator who has a master's degree in military history and a hobby of dressing up as a Star Wars Imperial Stormtrooper. The 23 short works in War Stories: New Military Science Fiction, released last week by Apex Publications, aren't some lame rip-offs of The Clone Wars. Nor are they tales of a boy and his robotic, mine-sniffing dog or cartoonish shoot-'em-ups about cyborg marines who shout, "Once more unto the breach!" before jumping to hyperspace at the edges of black holes. Instead, what Norwich University's Andrew Liptak has pulled together — along with his coeditor, Jaym Gates — is a collection of lean, absorbing and well-executed prose that was authored, in part, by those who have experienced war firsthand or have a working familiarity with military life. Accordingly, War Stories places the emphasis less on alien battlegrounds and futuristic military gadgets than on very human, or humanlike, soldiers who wage war, and the toll it exacts on their psyches. "The point of this anthology was not to champion war but to stand back and look at it on a broad canvas, and do so in a way that people find interesting and entertaining," explains Liptak, a 2007 Norwich grad who currently works as student-services adviser for the military university's online graduate program. 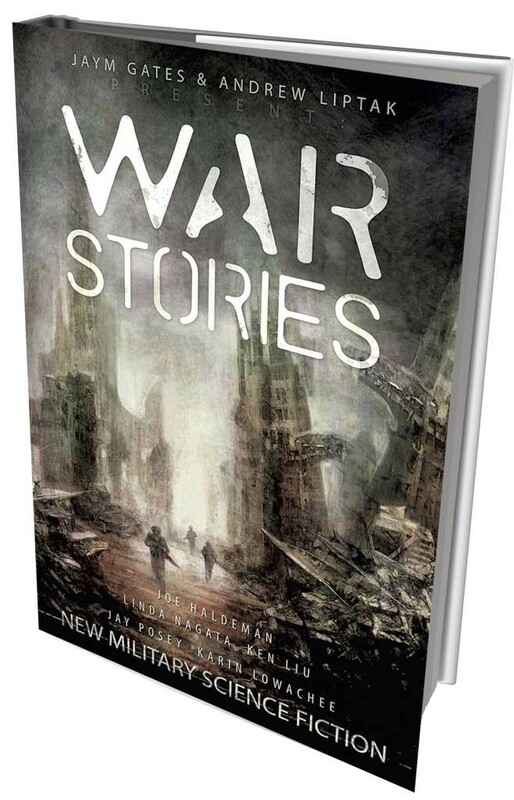 War Stories: New Military Science Fiction, edited by Andrew Liptak and Jaym Gates, Apex Publications, 360 pages. $16.95. War Stories is divided into four sections: "Wartime Systems," "Combat," "Armored Force" and "Aftermath." Many of the stories, especially those in the "Aftermath" section, wrestle with such present-day realities of military life as posttraumatic stress, suicide, the moral implications of remote killing via drones and the difficulties of re-acclimating to civilian life after years of extended deployment. Liptak and Gates — both of whom write science fiction themselves, but not for this collection — first conceived of the idea for War Stories in 2012. At Readercon, an annual convention held in Burlington, Mass., devoted to SF, fantasy, horror and speculative fiction, they assembled a "wish list" of authors whose works they hoped to include. Topping their list was Joe Haldeman, an award-winning SF author and member of the Science Fiction Hall of Fame who happened to be the convention's guest of honor that year. Haldeman is a decorated Vietnam War veteran best known for his 1974 novel The Forever War, which won science fiction's highest honors, the Hugo and Nebula awards. He agreed to contribute one of his previously published works: "Graves," about a Vietnam vet haunted by night terrors years after a mission that involved investigating an officer's badly mutilated corpse. With Haldeman on board, Liptak and Gates were inundated with submissions from other acclaimed authors around the world. One of the more impressive aspects of the collection is its broad international representation. The anthology includes works by award-winning authors from the United States, Canada, South Africa, Guyana, Brazil and Australia. Liptak considered it important to include a diversity of voices, he says, in part because war is a product of society, and the ways nations wage war reflect their unique histories. Also notable is the book's abundance of female authors — who, as Liptak points out, often don't get their due respect in science-fiction circles, especially when they write military-oriented fiction. "The military is changing. We've got women who are serving on the front lines now and going to combat schools," he says. "That's an important story to tell that really hasn't been told yet in science fiction." One of Liptak's favorite sections was "Aftermath," for which he and Gates asked prospective contributors to address how war affects soldiers and the people around them. "That was a particularly interesting set of stories to read because of the variety," he recalls. "The stories we wound up picking were fantastic. Some of them are my absolute favorites of all the stories I've ever read." Among them is "Coming Home," by Janine K. Spendlove. In the world of SF/fantasy publishing, Spendlove is known primarily for her best-selling trilogy War of the Seasons. When she's not writing, she serves as an active-duty Marine Corps pilot flying KC-130s, which are large aerial tankers used for refueling other aircrafts midflight. In "Coming Home," Spendlove tells the story of Pia, a Marine pilot, and her struggle to overcome recurring visions of a mission she commanded that went awry. Some of her fellow Marines were killed, and others left behind — the latter a mortal sin in Marine Corps ethos. "I keep waiting to go back to the old me. The always-chipper, happy-go-lucky me," Pia tells a chaplain in the story. "So I guess what I want to know is when will it happen? When will I be me again? When will I feel right inside?" In "The Radio," author Susan Jane Bigelow tells the story of Kay, a "synthetic" warrior constructed from the remains of a human soldier killed in action. When Kay is separated from her entire army after a roadside bomb kills everyone else in her unit, she gets picked up by a band of human deserters. She must come to grips with her sense of abandonment, as well as the loss of identity that befalls a warrior who no longer has orders to follow or battles to fight. Addressing similar themes from a different perspective, "Enemy State," by Karin Lowachee, tells the story of a lover awaiting a soldier's return home from repeated deployments in deep space. When the soldier finally returns, the lover says, "In bed you told me about all the parts of you that weren't human anymore." Lowachee writes, "Every time you go back to the war, they steal another part of you. How much of you returns home?" It's clear she's not just talking about the returning soldier's artificial eyes and animatronic limbs, but about the fragments of identity that a combat veteran leaves behind on the battlefield. War Stories is all the more relevant given that the anthology was assembled, in part, at the nation's oldest private military college, where scores of Corps cadets will soon join the ranks of active service members deployed in overseas war zones. "War is around us. Just look at the last 10 years," Liptak notes. "Whether you agree with the wars in Iraq and Afghanistan or not, they've had a tremendous impact on day-to-day life in the United States." Despite being a Norwich alum, Liptak doesn't hail from a military background himself, nor was he a member of the Corps of Cadets, Norwich's Reserve Officers' Training Corps (ROTC). However, through his two uncles who served in World War II — one in the Philippines, another dead at the Battle of the Bulge — Liptak developed an early interest in military history. The 29-year-old traces his fascination with SF to his elementary school days in the 1990s, when his father took him to see a new Star Wars theatrical release. "It was a light-bulb moment for me," he recalls. "I never looked back." That dual interest in military history and SF inevitably led Liptak to Starship Troopers, Robert Heinlein's Cold War-era novel about interstellar warfare with an arachnoid species, often described as the beginning of modern military science fiction. Another favorite was Orson Scott Card's Ender's Game. Since then, Liptak has written much about what is, and what's not, good military SF. Liptak, a self-described "geek" who bears a slight resemblance to NSA whistleblower Edward Snowden, now writes quarterly book reviews for Lightspeed, a monthly SF/fantasy magazine, as well as biweekly features on speculative fiction for Kirkus Reviews. Through his blog Geek Mountain State, he has broken local SF-related news and organized a popular reading series featuring Vermont genre writers. Liptak readily admits that in his free time he enjoys dressing up in Imperial Stormtrooper costumes, of which he's bought and made several. More than just play, it's a form of community service for Liptak's New England chapter of an international costuming group called the 501st Legion. Members raise money for local charities such as the Make-A-Wish Foundation, the American Red Cross and Walk Now for Autism Speaks. "Those are incredible," Liptak says of the autism events, "because you have kids who don't usually look people in the eye look right at you, and you're this character who's basically stepped off the screen for them, and they love it. It's pretty amazing to see what kids' reactions will be — and grown-ups', too." Liptak cautions against drawing parallels between his fascination with military history and his penchant for dressing up as a foot soldier in a fascist regime. While he draws a line between reality and entertainment, he hopes some people who don't see war as a legitimate area of academic study will consider reading War Stories, and not only because it's diverting fiction. For sure, War Stories includes the genre's requisite dose of plasma weapons, power armor and gory combat scenes, Liptak admits. "But it's also a good way to get people to think about why we fight and why soldiers put their lives on the line." The original print version of this article was headlined "Psy Fi"